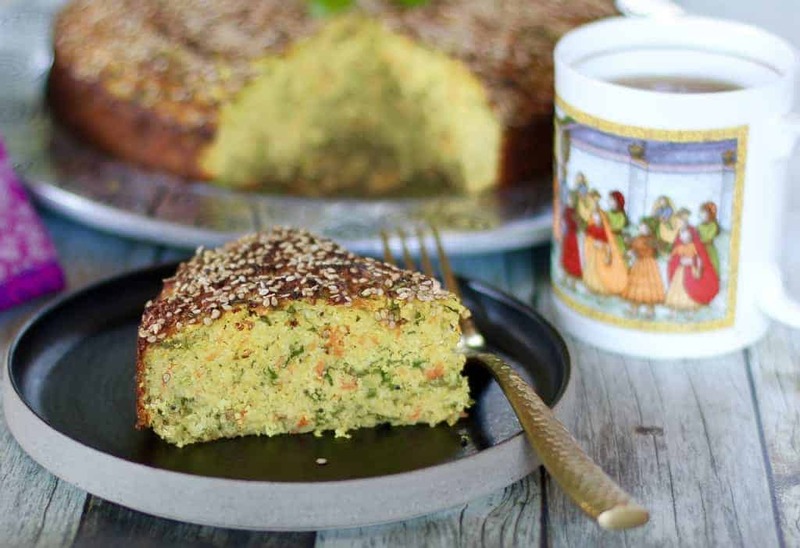 Handvo – A traditional gujarati savory cake made with rice, lentils and lots of vegetable like bottle gourd, fenugreek leaves and carrots. Spiced with fresh ginger and green chilies, tempered with mustard seeds, sesame seeds and dried red chillies. This wholesome dish can be enjoyed as a meal by itself or with a side of pickle or chutney. 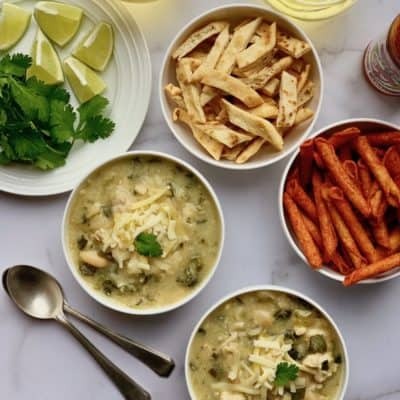 Updated to include Instant Pot version of this recipe! I first learnt how to make Handvo 12 years ago, when my older son was a baby. We had a nanny who took care of him and cooked amazing meals for us. She would make Handvo at least once a month and I absolutely enjoyed every last bit of it. I loved it so much that after she was no longer working for us, I called her one day to get the recipe. I have since made it many times and as much as it needs a bunch of ingredients, it is a no-fail recipe and so worth all the time and efforts. The key ingredient in this recipe is the dudhi/lauki/bottle gourd that gives the cake a super moist texture. As far as the dough, there are 2 ways of making it. First is a short cut method where you simply soak the handvo flour in yogurt, oil and water overnight. The second method is to soak the rice and 3 types of lentils for 6-8 hours, grind them and then let the dough ferment overnight. 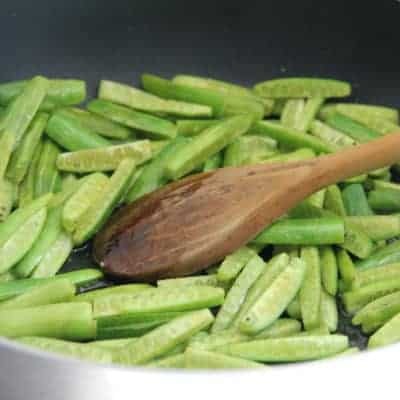 Peel and grate the bottle gourd, about 3 cups. Peel and grate carrots, about 1 cup. Prepare the methi leaves by taking only the leaves and discarding the thicker stem. Wash few times and then chop finely. Take about 1-1/2 cups of methi leaves. Peel and grate ginger and crush the green chilies. Make tempering by heating oil. Add mustard seeds and once they start spluttering, turn the heat off, add sesame seeds and dried red chillies. Add all the ingredients in the batter and mix well. Pre-heat oven to 350 degrees. Prepare a baking pan by greasing all the sides and the bottom. Add baking soda to the batter and mix well. (Note – this should be done just before you are ready to pour the batter in the cake pan). Pour the batter in the cake pan, I used a spring foam pan but a bundt cake pan or any baking dish works well. Sprinkle sesame seeds on top. Bake between 30-45 mins, checking after first 25 minutes. For my oven it takes exactly 25 mins and then I broil for the last 5 mins to get a crispy browned top. Let it cool for 20 mins and then take it out of the baking pan. Enjoy for lunch, dinner or snack with a hot cup of chai! 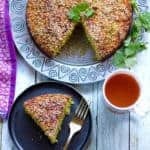 Handvo - A traditional gujarati savory cake made with rice, lentils and lots of vegetable like bottle gourd, fenugreek leaves and carrots. 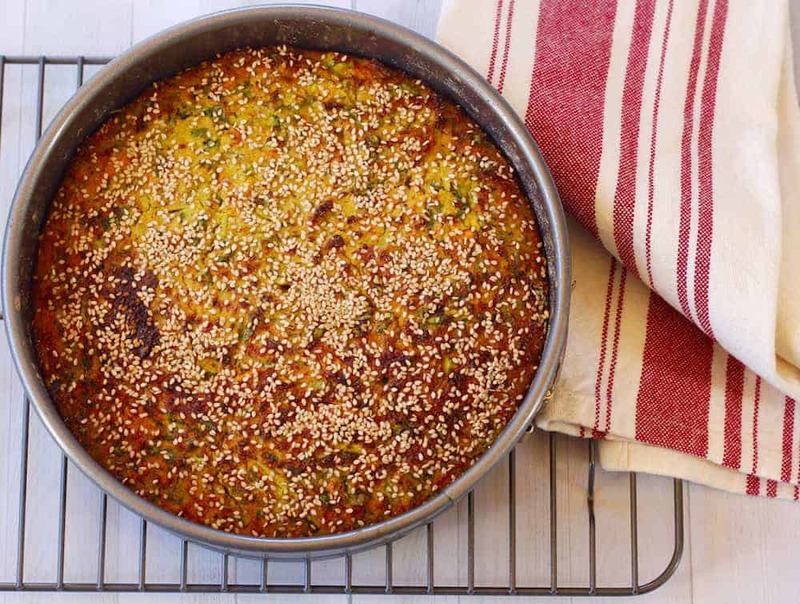 Spiced with fresh ginger and green chilies, tempered with mustard seeds, sesame seeds and dried red chillies. Mix all ingredients from part 1 in a large bowl and keep in warm place for 6-8 hours. Make tempering by heating oil. Add mustard seeds and once they start spluttering, turn the heat off, add sesame seeds and dried red chillies. Add all the ingredients from Part II and the tempering to the dough. Mix well. Pre-heat oven to 350 degrees. Prepare a baking pan by greasing all the sides. Add baking soda to the batter and mix well. Pour the batter in the cake pan, I used a spring foam pan but a bundt cake pan or any baking dish works well. Garnish with sesame seeds from part IV on top. Bake between 30-45 mins, checking after first 25 minutes. For my convection oven it takes exactly 25 mins and then I broil for the last 5 mins to get a crispy browned top. 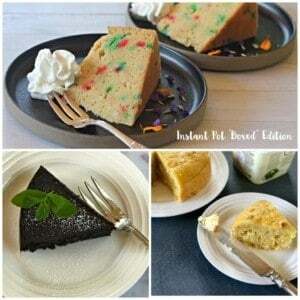 Here is the Instant Pot Handvo Recipe using a 7″ springform cake pan! Prepare a 7” cake pan by greasing the bottom and the sides. Mix all ingredients from part I in a large bowl and keep in warm place for 6-8 hours. Make tempering by heating oil in a small pot. Add mustard seeds and once they start spluttering, turn the heat off, add sesame seeds and dried red chillies. 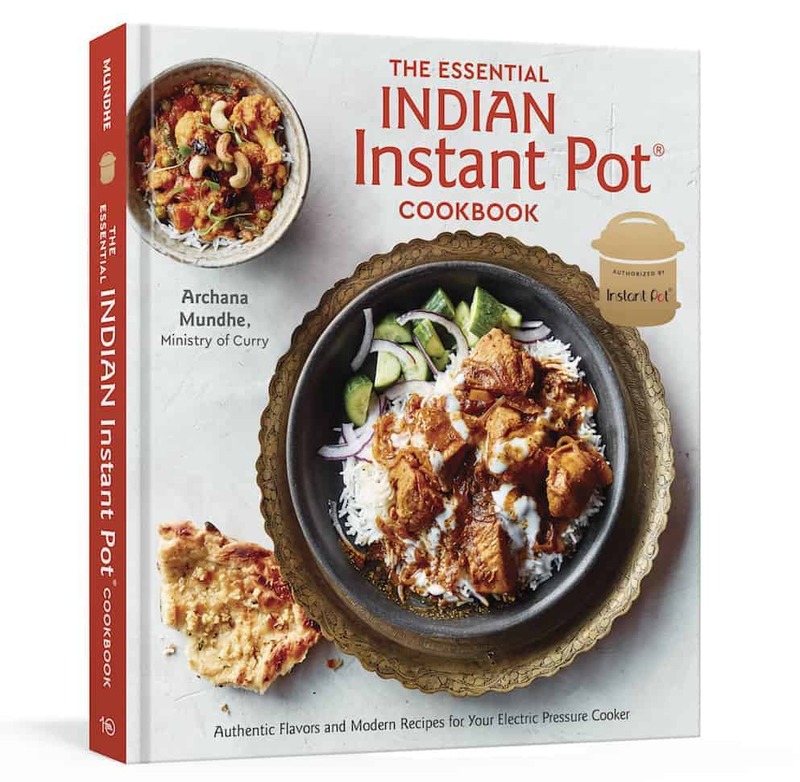 Add 1 cup of water to the Instant Pot insert. Add baking soda to the batter and mix well. Pour the batter in the cake pan. Garnish with sesame seeds from part IV. Cover the cake pan with aluminum foil. This will prevent from any steam/water from getting in the handvo. Place the cake pan on the trivet, carefully put the trivet with the cake pan in the Instant pot. Close Instant Pot lid with pressure value to sealing. Cook on Manual(Hi) for 30 mins followed by NPR. Open Instant Pot and carefully take out the trivet with the handvo. Broil in the oven for 5 minutes to get a crispy browned top. Instead of using Handvo flour you can also soak 1/2 cup rice and 1/2 cup mixed lentils. Grind and then allow the batter to sit for 6-8 hours or overnight. Vegetables used in part II can vary. Achaea, I used to work in IT also. What was your role? I was a BSA and QA tester. I miss it sometimes but am happy to be home with my little boys. 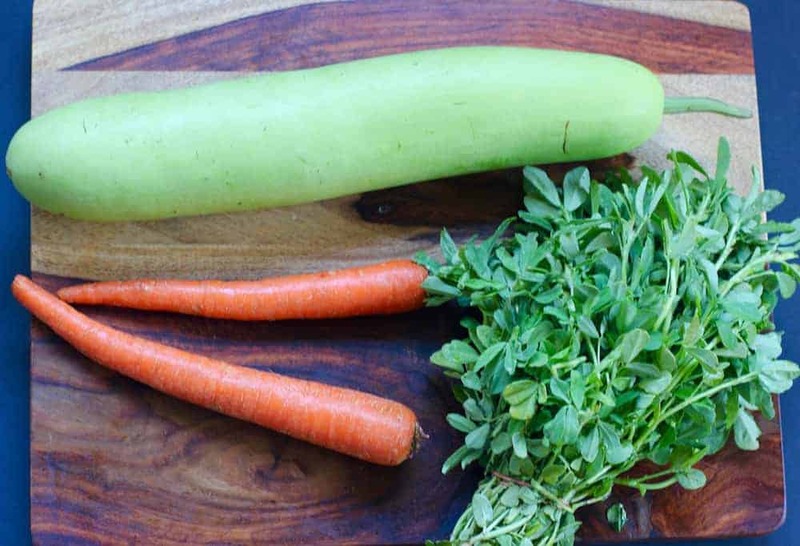 This recipe looks good and healthy. Thank you Joanne! I work as a sustaining engineer supporting process manufacturing software. Love my full time job as well blogging! So glad to have met you, love your blog. Also, your pix are great! Amazing. Will try making it this weekend and let you know how it turned out. Thank you Uma! Would love to know how you like it. Archana, could you please send over some of the leftovers to Pune? 😀 The pictures are very tempting. 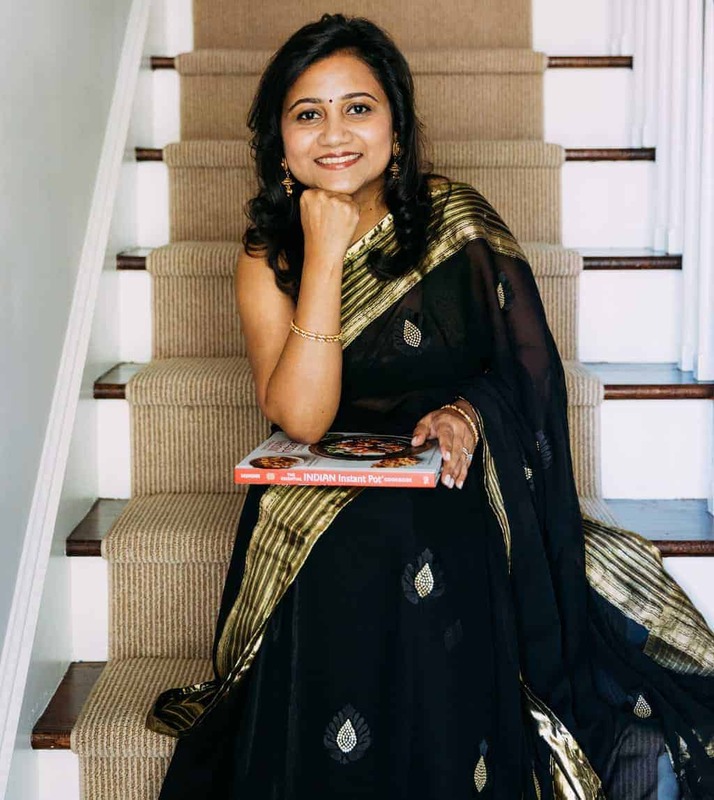 I would really love to see you try your hand at Bengali cuisine too, that way I will get to learn and keep the husband happy. 🙂 I tried making aaloo posto today, let’s hope everyone likes it. Thank you! Wish I could send some over for you.. I would love to try Bengali cuisine. How did your aloo posto turn out? I am googling that next 🙂 as i am not familiar with lot of Bengali foods. My posto turned out fine. Although, I should warn you that it has a peculiar taste that not everyone enjoys, since it contains a lot of khus khus. The online recipes will tell you not to put onions, but here at home we do. Take 3 tbsps mustard oil and heat it on a high temp. Put paanch fodan and let it pop. Add 3 cut onions and 4 green chillies, saute till onion becomes red. Add a little bit of turmeric and salt (I also add a little bit of red chilli, but that’s not a part of the real recipe. Add the potatoes and khus khus paste. Add half a glass of water and let it cook. The consistency should be semi dry, serve with plain rice and moong/urad dal; along with aaloo bhaja (i failed in making this, but you can give it a shot). Thank you! Wow your home recipe looks amazing. Can’t wait to try it out. I’m pinning this. Sounds so amazing. Very nice Archana. This is in my todo list for a long time. Need but that flour. Great share. 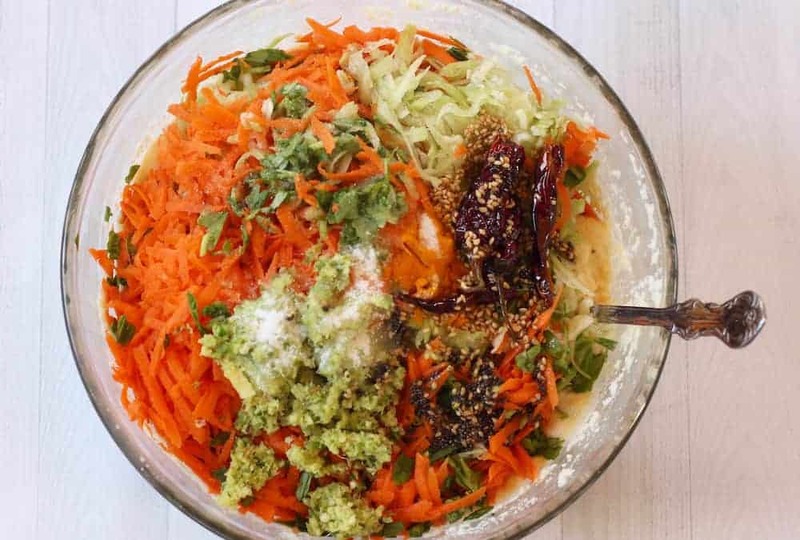 Vidhya, you can also make this with soaking lentils and rice. No special flour needed. This looks delicious! Such a colorful and healthy treat! Thank you Antonia! This is one flavor packed recipe. 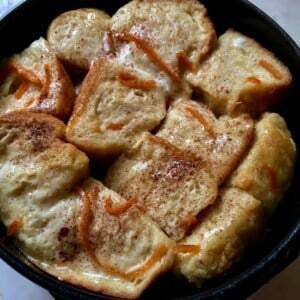 I have a very similar recipe… yours looks amazing! Thank you Annika! This is my favorite savory cake. Hi Bella! So excited to hear that you are making this. 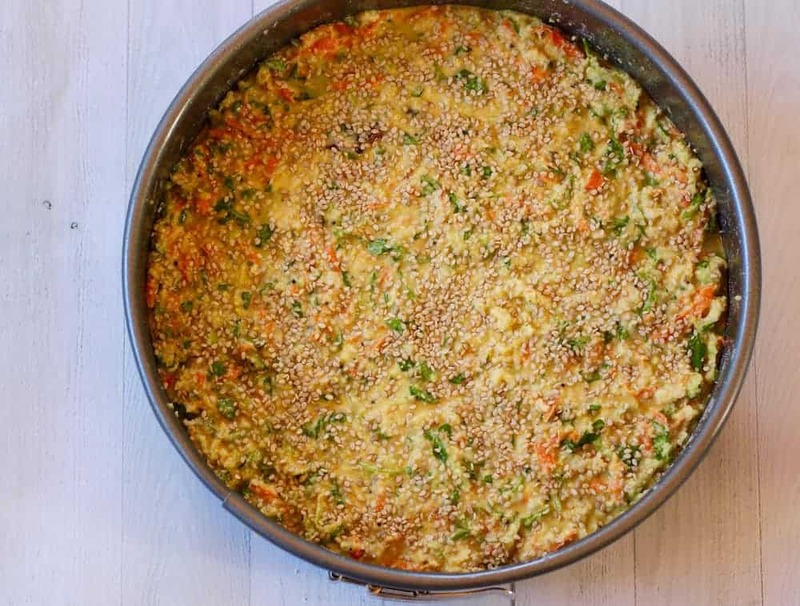 Yes you can substitute brown rice and quinoa for some rice. Also 8×8 baking dish will be perfect! Let me know!! What kind of cake pan do you recommend? Non stick, Pyrex or ?? I would recommend a metal/aluminum cake pan. Sorry, I miss saying my question is about Handvo recipe you have for IP. Does the dough need to be out or in the fridge. Hi Archana. I made it today in the IP. It came out excellent. My first time making it. I don’t usually like it as it is dry, but this was moist. However, i couldn’t get the beautiful color like yours. I did broil but at 450 and almost on the middle shelf for fear of it drying out. Is that why? Wish I could add a picture. Hi! I usually broil on top shelf just for few mins, but overdoing can dry it out. Email me the picture. Sorry don’t have the feature of adding photo to the comments yet. Not sure how to email you. I am SO glad you liked the handvo. 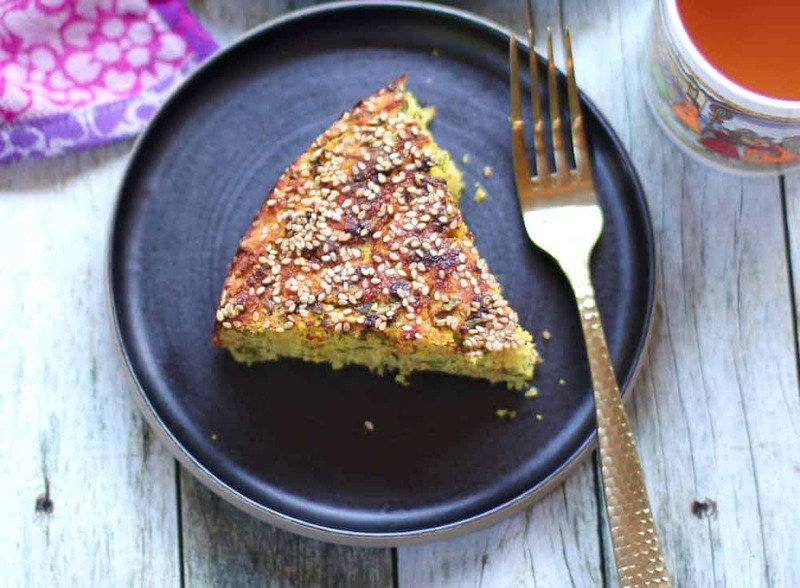 You can make dhokla with the same flour. I do not have a published recipe but if you search there will be a few. thank you for reply so only handvo or dhokla? Hello Archana! I tried this in the IP and it turned out great. Thanks for sharing this wonderful recipe. I had a question , I was thinking of getting a spiralizer but unable to make up my mind. 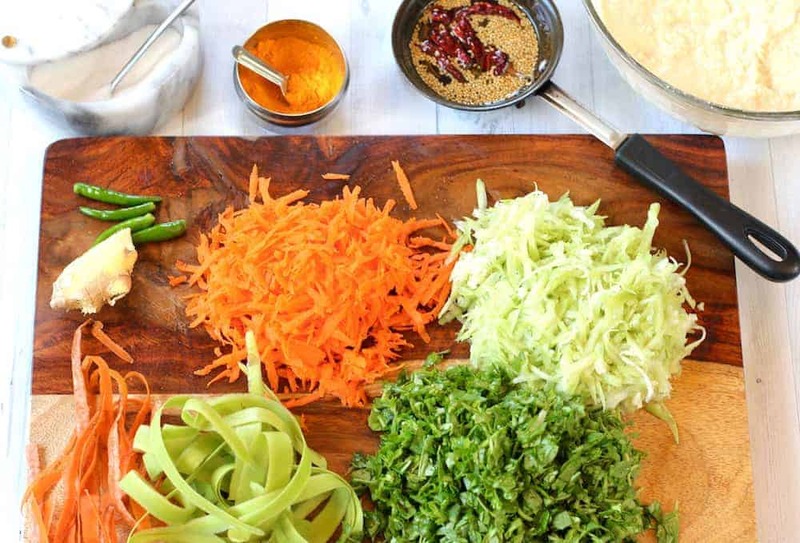 I want to know if a spiralizer would work well for this handvo recipe and any other Indian recipes like muthiya, Raita, etc that requires shredding. Hi Sonia, Thank you of your feedback. I am glad you enjoyed the handvo. I would not recommend spiralizer for Indian dishes like muthiya, handvo or raita. What you need is a grater and I love my food processor with grater blade. Hope this helps. I have never made handvo and want to try with a mixture of rice and lentils. When I grind them, what should be the consestency of the batter? Also, when you say ferment it after grinding for 6-8 hours I assume it should be mixed with the yogurt first, right? Consistency of cake or idli batter. And ferment with yogurt in it. Hope this helps. Thank you for your kind words. I will forward to reading your blog. 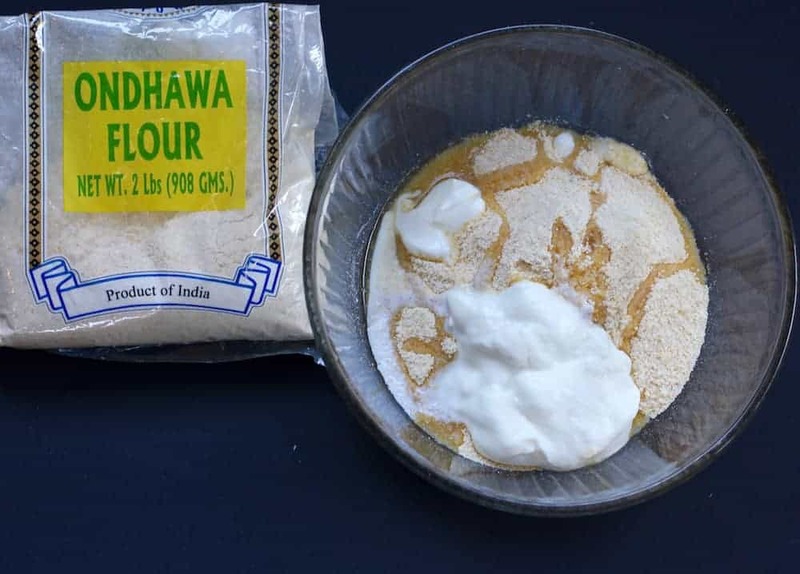 Do I have to use the Ondhwa flour bag for this or can I use the Gits Handvo Mix? Hi Archana. I want to make this today. I dot have dudhi but have kabocha squash. Do you think that would work instead? Hi , this has to be such a true to heart handvo recipe ever. 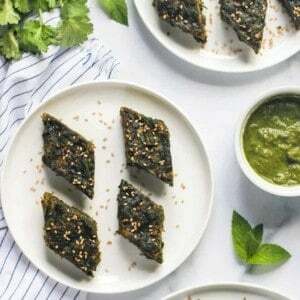 Even though its not a part of our cusine i enjoy gujju food a lot and was hunting for a cracker recipe and found yours. My whole family relished it till the last bit and it was worth calling your maid for this amazing recipe. Thanks a ton. Thank you for your lovely feedback. So happy to hear that your family enjoyed this!